India women were looking for their third consecutive gold medal at the Asian Games but it was not to be as Iran completed a double and both the men and the women took the yellow metal. 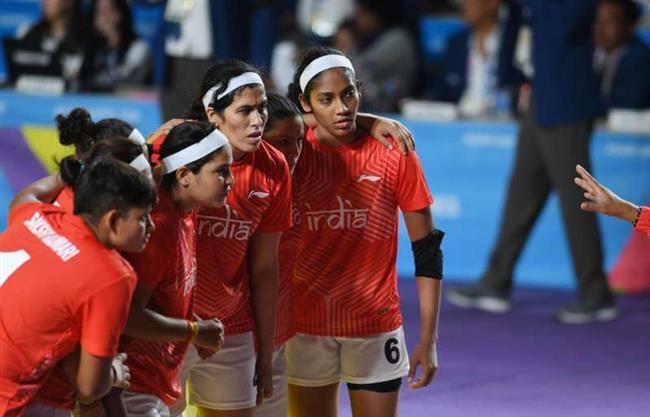 However, Indian women put up a massive fight in the end and did not go down easy -- a stark contrast with how the men went down in the semi-final yesterday. The picture, however, remained the same. Indian men's captain Ajay Thakur's teary eyes and sullen face as Iran broke into euphoria. With the silver medal, India now have a total of 24 medals -- 6 gold, 5 silver and 13 bronze. While the men's team went down twice in the event at Asian Games 2018, this was Indian women's first loss and that came in the final. Indian women opened up the final in a strategic manner when they took a comfortable 4-1 lead over Iran. However, Iranian women were high on confidence after a stupendous defending performance by their men's team against India in the semi-final yesterday and they showed they were here to battle. Just like the men's team, Iran women also relied on their defence to grab points against India. Over the course of the first half, Iran took down Indian raiders Randeep and Payel to not only grab points against India but also deplete their team. At half time, India led Iran 13-11 but they were down to just four players while Iran had the strength of six players. After the break, it all fell down for India as Sonali was taken down after which India's premier defender Sakshi Kumari was also touched by the Iranian raider. Iran then inflicted an all-out on India to take a 17-13 lead. However, Randeep and Sakshi earned subsequent points on raids to reduce the scoreline gap to 17-15. Immediately after, Kavita yielded a point by trying to tackle an Iranian raider to swell Iran's lead back to three points. While the Indian defence remained solid throughout, it were the loopholes in the attack that did India in. In a thrilling finish, Iran led by four points at 25-21, when Sakshi Kumari made a three-point raid to reduce it to 25-24. After that Iran got a bonus point following which Sakshi was taken down in her raid and with that Iran took a 27-24 lead. Thereafter, it was only a matter of time before Iran beat India. In what can only be termed as a debacle, Indian men were trounced by Iran 27-18 in the semi-final and had to settle for bronze for the first time in the history of Asian Games. India, who were the Asian champions and are the world champions, were completely outclassed by an inspired Iranian defence. From avoiding an all-out, Iran inflicted an all-out on India and took the match away. Earlier in the day for India, Rohan Bopanna and Divij Sharan won the gold medal in the men's doubles tennis event with a 6-3, 6-4 win over Kazakhstan's Aleksandr Bublik and Denis Yevseyev in the final in Jakarta. Before that gold, Indian rowers put up a fabulous show as the Indian team clinched a gold medal in the men's Quadruple Sculls final. Before that gold, Dushyant Chauhan bagged the bronze medal in the men's Lightweight Single Sculls final and the team of Rohit Kumar and Bhagwan Singh took a bronze in the men's Lightweight Double Sculls final. Also, Heena Sidhu settled for bronze in the 10m Air Pistol Women event after finishing with a score of 219.2 while Manu Bhaker endured another disappointing day in Palembang with a fifth-place finish in the same event.